Today I'm gonna help you solve all 12 levels in a neat android game called "MechBox" (previously called "Mechanical Box") made by OGUREC APPS. I'm gonna do my best to explain each level and if you still need help to pass them you can also take a look at the video above for visual walkthrough. Start by sliding down the plate with the text "This is a mechanical Box..." and hit the play button. Now press the red look button several times to break the glass. Now light the top buttons in the given order: 11001, so ON-ON-OFF-OFF-ON and press the red lock button to complete level 1. Start by entering the written given code: 4753 then press the red button. Take the battery and place it on the magnifier glass. Move the lever down and press the green button. You'll have to stop on the green dot. Now move the lever several times to break it. Then attach it to the keypad. Enter the code 3381 to complete level 3. In this one you need to write instructions. Start by writing DOWN and a crane will fall down. Last step is writing OPEN to open the hatch, then take the lamp and place it in the slot next to the red button. Press the button to complete level 3. Tap the arrow shape in the top right side to reveal an hidden tray on the left side. Slide the tray and take the screwdriver. Use the screwdriver to open a panel on the bottom side, the one that's missing a screw. Use the screwdriver again on the center of the level to get a hidden lamp. Now place the lamp on the tray, right where the screwdriver was. Slide the keypad down, use the screwdriver on the electrical panel. Slide the "Home" button to reveal a code: 2714, enter it on the keypad. Place the battery in it's slot. Press the green button next to it, than take the battery out! Now press the BOTTOM GREEN button than the button above it. If done right the panel with the screwdriver will slide down and reveal a puzzle. Start by pressing the "HOME" button in the bottom-right corner. You will notice that the close "X" button is actually another wire :) Take it and use it to replace the broken wire. Start by moving the bottom-left spinning cog to the empty slot in the top right corner. Press the button to activate the keypad. Now enter some random codes and the number 2810 will appear. But as you can see the keypad has no "0". To figure out the right code you need to assign number to the letters in the word: "RANDOMIZER". So R=1, A=2, N=3 ... E=9, R=1 (already assigned 1 to R). Now since the number 0 is missing you have to spell ZERO, to get the code: 8915. Now that you have the "0" key enter the code 2810 to complete level 8. Slide the "HOME" button up to reveal the hidden button in the top right corner. 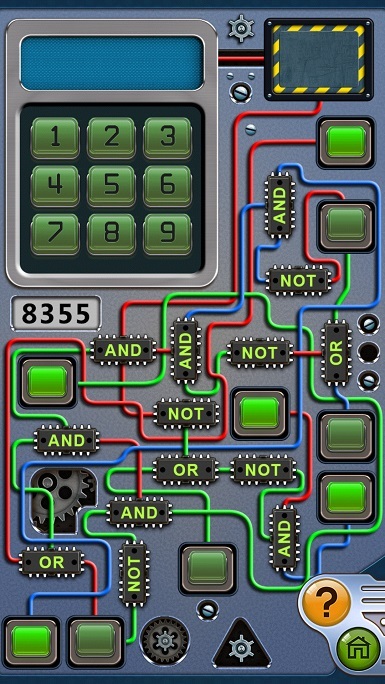 Now you have to figure out which button to turn on based on AND NOT OR operators. AND - all wires have to be ON or OFF; OR - at least 1 wire must be on; NOT - reverses the wires meaning on is off, and off is on. Sound too confusing no? All of the steps in this level are randomized, so you need to figure out on your own. First math all the pairs and reveal all the symbols (making screenshots or writing them on paper helps). When the "Press key to being" just press the key symbol to start. Now you will have to solve 6 packs of icons in a row to get to the next part. Next you will encounter a code with a diamond symbol but there is now diamond symbol anywhere, you have to make it by pressing: Carbon (C) + Pressure (two arrows) + Temperature (thermometer) + Time (watch). Now you should have the diamond button and you can enter the password. Level 11 is a secret level, to access it go to the level selection page and drag the level 1 button in the empty slot after level 10. Start by sliding the panel on the MIDDLE-RIGHT side using the moving knob on the lower left corner. In the word NO POWER the letters N and E flicker so remove the to get OPOWR. The buttons have for colors: ORANGE, PURPLE, WHITE and RED. The letters in OPOWR corresponds to the colors, so press them in OPOWR order: 13145 or orange-purple-orange-white-red. Now a the battery will be revealed, put it in the slot below NO POWER.